Success continues to follow a group of senior male athletes early this winter season as the Redskins varsity basketball team is off to a quick 3-0 start. Many of the players were on the football team that went undefeated in the regular season and won the school’s first ever district championship. The Redskin cagers opened their season with a 52-31 decision over Capac in a non-league contest last Tuesday night. Sandusky raced out to a 13-0 first quarter lead and held a commanding 26-6 lead at the half. A 22-12 fourth quarter sealed the win for the ‘Skins. Seniors Danny Hale and Brandon Potter combined for all but two of their teams’ points in the opening quarter. Hale finished with a double-double, scoring 10 points and snagging 12 boards and had five assists. Potter led Sandusky with 14 points, six rebounds and three steals and Justin Miller pumped in 11, eight of which came in the second quarter. Josh DeKam manhandled the boards, ripping down 15 rebounds. As a team, the ‘Skins canned 15 of 23 free throws, connected on five triples and grabbed 47 rebounds. Last weekend, the Redskins played a pair of games at Saginaw Valley State University. Friday night, they cruised to a 51-36 decision over Cass City and on Saturday, they overpowered St. Charles 62-41. 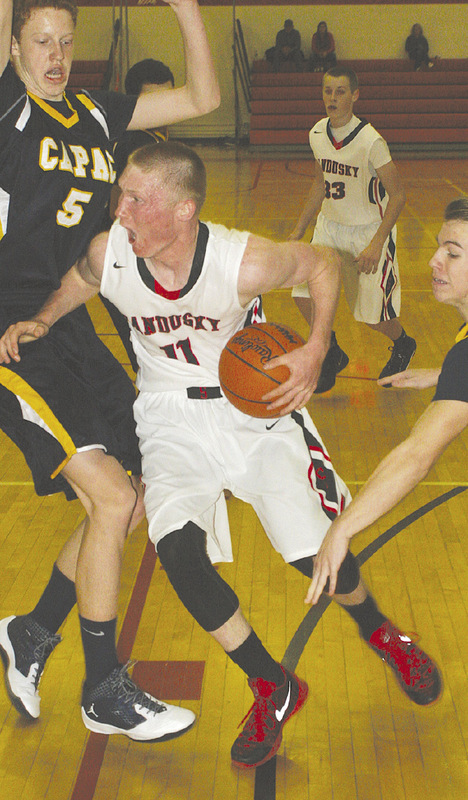 Against Cass City, Sandusky led 12-10 after one and just 16-15 at the break. A 15-8 third quarter advantage gave them some breathing room while a 20-point fourth quarter nailed down the W.
Hale (five rebounds) had a big night, ripping the nets for 22 points including16 in the second half for the winners. DeKam fired in 14 points, 12 of which came in the second half. The duo teamed up to score all 20 points in the fourth quarter. Against the Bulldogs, Sandusky jumped out in front 19-7 and never looked back. While their defense was pressuring St. Charles into numerous turnovers, the ‘Skins offense continued to click. The Redskins were in control 27-16 at halftime and used an 18-9 advantage in the third to put the game away. Miller paced the scoring attack with 12 points, all coming as a result of the three point shot. Hale (four assists) notched his second double-double of the season with 11 points and 10 rebounds. 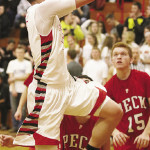 Cade Seiler had 10 points while Potter tossed in eight. DeKam and Derrick Scott scored seven points apiece. The Redskins return to action Friday night when they host Laker in a GTC crossover, non-conference game.